U-M President Schlissel performs the first search of the DJN archives, now hosted by the Bentley Library. 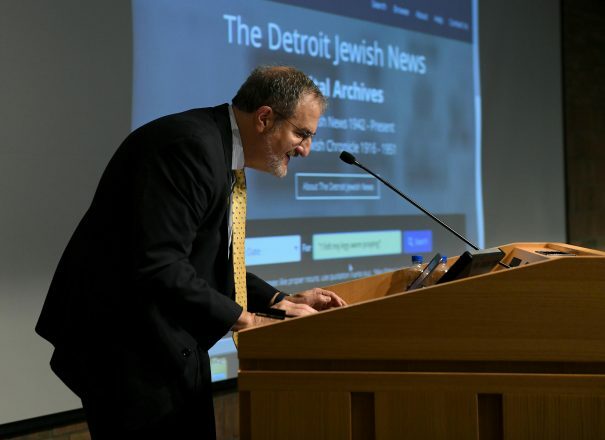 On Monday, Nov. 5, the U-M Bentley Historical Library launched a new platform for the Detroit Jewish News Digital Archive, a free, searchable database containing more than 100 years of digital copies of the Detroit Jewish Chronicle and the Detroit Jewish News. According to Bentley Director Terrence McDonald, the digitization is important to the Bentley Library’s ongoing effort to preserve a diverse history of both the university and the state of Michigan. The digital archive was completed in partnership with U-M Library, which developed the software platform and maintains the infrastructure for supporting and hosting the content. The Detroit Jewish News Digital Archive will contain every issue of the Detroit Jewish Chronicle (1916-51) and the Detroit Jewish News (1942-present). Researchers will be able to browse by date or use a full-text search. Those using the archive will be able to access it both through the U-M online database and through the DJN website as before. The Bentley will add future issues of the News to the archive and will also capture content on the DJN website. Arthur Horwitz, publisher and executive editor of the Detroit Jewish News and chair of the Detroit Jewish News Foundation, says the archive will preserve the shared history of Michigan’s Jewish community. Horwitz began planning for a way to preserve and protect back issues of the News in 2002, when a fire destroyed the DJN’s Southfield offices. No one was hurt, and offsite backups of business files made the next issue only a day late, but the bound volumes of the News stored in the office suffered some smoke and water damage. When readers found out about the fire, Horwitz was inundated with questions about what happened to the newspaper archive. 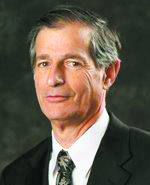 In 2011, Horwitz helped launch the Detroit Jewish News Foundation, which created the William Davidson Digital Archive of Jewish Detroit History in 2013. At a gala last May, it was announced that this archive will be revamped and moved to the Bentley’s servers. “The digital archive assures the story of our community, and the individuals and families who continue to shape it, is always at our fingertips,” Horwitz said.